It doesn’t take a professional perfumista to detect the richness that lies off the coast of mainland Peloponnese. Takes a deep breath, hop on a yacht, and follow the scent across the Argo-Saronic Gulf to discover the wonders of the Island of Perfume. It’ll lead you to the Saronic Island of Spetses. Between orange trees and pine forests, rustic beaches and crystal-clear waters is a refreshing vacation destination that will enlighten the senses. The Venetians gave it the name “Island Spezia” (spice) for its important role on a major trade route, as well as for the potent scent of jasmine, pine, thyme, and other aromatic herbs that give life to its atmosphere. 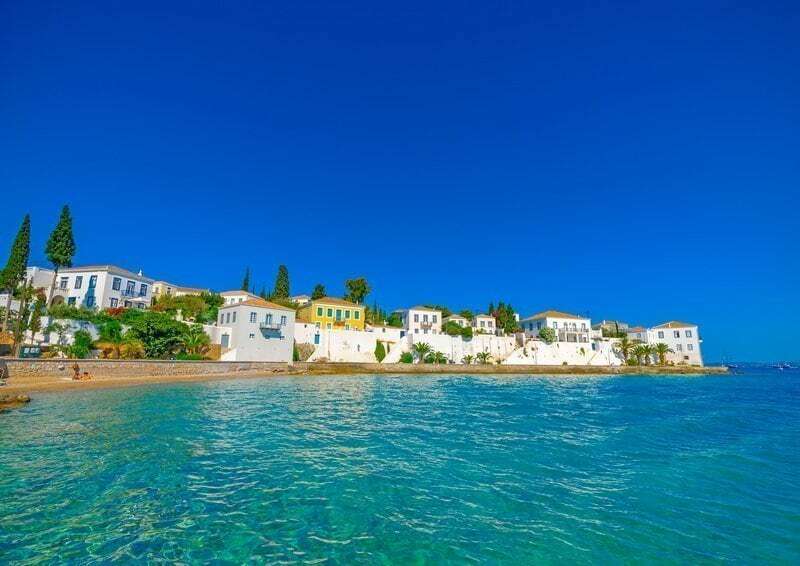 Though part of the larger attraction of the Saronic Islands, the island of Spetses is a spectacle all on its own. Not only will you find an idyllic landscape of rolling hills and picturesque coves mixed in with an authentic charm, but this beautiful island is a hub of luxury real estate and boating. Affluent Athenians rush to their vacation homes in the summer, and we can’t blame them. The island of Spetses offers its guests a refreshing breath of fresh air, in addition to beauty, heritage, history, culture, and gastronomic delights. This Greek island is particularly known for its discretion, so much so that it’s become a popular destination for royal weddings in order to bypass a media frenzy. Although very peaceful, the laughter and chit-chat that take place in waterfront bars and restaurants around the popular Old Harbor fill its atmosphere with good humor. Buyers in search of a private R&R getaway, to return to again and again, often opt for traditional whitewashed Greek houses, some dating back to the 20th century, in proximity to the harbors and beaches. As you may already know, a Greek home is not Greek without airy outdoor living spaces, to dine on the veranda or sunbathe by the pool. But some buyers tend to go for luxury villas with lush gardens and beautiful courtyards. The island has one gate of access: the port of Dapia. It’s a beautiful welcome, overlooked by whitewashed, Neoclassical houses, mingling alongside cafes and boutiques. Locals drink espresso and play backgammon in the shade of palm trees. The island of Spetses is wrapped with cobbled winding, cobbled coastal roads leading to magnificent chateau-like hotels and a landmark square, where an imposing statue of the beautiful Greek heroine Laskarina Bouboulina stands proudly in memory of the Greek War of Independence. Looking out towards the sea, the scene is sensational: a surreal landscape, like an impressionist painting, a melange of pastels, with mountains in the background. For a taste of more history, visit the historic village of Kastelli and wander through ancient Byzantine churches, a carved wooden sanctum, and marvel at its exceptional panorama of clay-tiled roofs, the town, and the sea. The atmosphere on the island of Spetses is intimate, partly because of its no car policy, save for those who have special permits. Those who don’t let their hair blow in the wind in colorful horse-drawn carriages or on bicycles or mopeds, as children giggle in delight while riding bikes in the piazza. Couples, even families, love to take romantic strolls along the seafront promenade to see the catch of the day on display. You’ll also come across beautiful mansions, charming domed churches, and traditional tavernas serving fresh cuisine. Still, the most popular ways to discover the island is via water taxi or yacht (we advise the latter). The island of Spetses is the perfect place to fly off and under the radar, without putting any luxury in jeopardy. They don’t call it the Monaco of Greece for nothing. Contact BARNES Greece to buy a luxury property in Spetses.